Leave no room untouched, and no space uncleaned with a steady supply of topnotch quality janitorial products only from CTC! We have a full range of cleaning supplies designed to make your cleaning and sanitation needs easier and more efficient! It does not matter how big or small your cleaning needs are; CTC has the right product for you. We have everything from cleaning chemicals to dispensers to trash bin liners – all designed for heavy-duty commercial and industrial needs. We have the widest range of product options – from cleaning equipment to cleaning chemicals. We have a large, stocked inventory so you can rest assured that we have your cleaning needs covered – no matter the size of your facility. We offer our products without requiring a minimum amount of orders and will accommodate your needs! We can help enhance your image. Whether it’s keeping your restrooms fully stocked, your glass windows sparkling, or your floors spotless, our full and steady supply of janitorial products will help you make sure you’ve got your best foot forward day-in and day-out! A clean business is a good business – especially if it is compliant with the regulations set by the Health Department and the OSHA. CTC will partner with your facility to help you achieve safe, regulation-compliant cleanliness in your facility! CTC’s specialization has always been 101% complete customer satisfaction and that’s what we can give you with our janitorial products. We don’t just deliver quality products – we work hand-in-hand with you and your personnel to ensure that you get the best results from the products that we offer and achieve your facility’s cleanest potential. Why do you think we’ve lasted over a hundred years in this business? 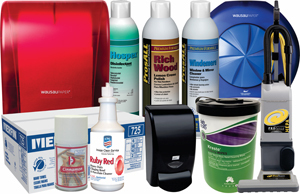 Contact CTC today and get started on your complete supply of janitorial products! Call 800-926-5646 to get started.